A lot of you are probably familiar with the Criterion Collection; a gold-ribbon line of classic DVDs (some old, some new) beautifully presented with thoughtful, extensive extras. I don’t have very many Criterion DVDs — unfortunately they’re rather pricey — but treasure the few I do have. I was pleased to notice that one of my favorite (and, I’m guessing, little-seen) films of last year is getting the Criterion treatment: “Everlasting Moments,” Swedish filmmaker Jan Troell’s turn-of-the-century drama about a woman whose life is transformed by photography. An unhappily married working-class mother, Maria struggles with the day-to-day dreariness of her life — until one day she discovers the magic of taking a photograph, of how she can capture a fleeting moment of beauty to treasure forever. It’s a quiet, beautiful film, and should look lovely in Criterion’s new digital transfer. Extras include documentaries about Troell and a collection of portraits by Maria Larsson, the real-life woman who inspired the film. 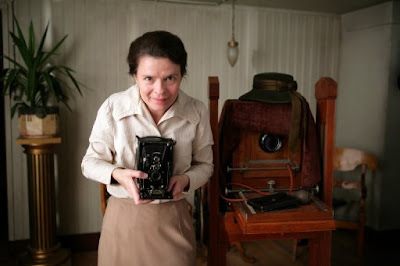 Say ‘cheese’: Maria Heiskanen holds the camera in “Everlasting Moments” (photo courtesy IFC Films).